One of the many features of Blueprint Enterprise, our on-premises print management solution for corporations and government agencies, is something we call Policy Print. It helps companies to reduce printing costs and achieve their sustainability goals by setting and enforcing policies for specific types of print jobs. 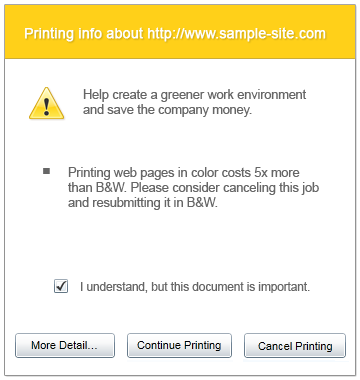 Simple pop-up messages will appear on an employee workstation when a print job is submitted that does not comply with the rules you set. For example, you could create a rule that discourages the printing of PDFs, using a pop-up message that shows the cost of the job and reminds the employee that the format is intended as a digital alternative to printed documents. This message could give the employee an opportunity to cancel the job or continue with the print despite the information. Or, you could restrict any print job coming from a web browser or email application with a pop-up that shows the cost of the job and asks the user if it’s really necessary. There are countless scenarios and possibilities, and we have found that our customers can exceed their cost savings goals when they use Policy Print to educate the workforce and help instill more mindful printing habits. The top 1% of print jobs (in terms page count) is typically between 50-75 pages. In other words, only 1 out of every 100 documents tends to be 50 pages or more. This top 1% usually represents around 20% of the organization’s overall print volume. Knowing this, I often recommend that companies introduce Policy Print by addressing these print jobs first, and then gradually add more policies as needed to reach volume and cost reduction goals. By implementing a warning trigger on print jobs over 50 pages, the organization can gently introduce pop-up notifications without inundating the workforce with several new policies all at once. By targeting only the largest print jobs, much can be gained on the edge cases alone. In my experience, these large print jobs are cut in half when you apply such a warning trigger. When employees see the actual cost of the job they are submitting, they are far less likely to proceed with the print. Also, employees often realize that they don’t really need to print the job to read the content, and instead choose to keep the file in the digital realm or print only the pages they truly need. The reality is that in most cases, employees are not even aware of the size of their print job until after it starts printing. Using automatic warning messages on print jobs that exceed certain thresholds makes it easy to save money and promote more mindful printing habits. Many of the customers I have worked with report an overall print cost reduction of 10% when employees cancel just half of their large print jobs. We recommend that our customers run Blueprint Enterprise for 60-90 days before implementing Policy Print. This way, there’s a good sampling of print data to help identify their top 1% threshold. Companies often buy into this approach as an introduction to the automatic messaging and policy enforcement feature because it’s triggered infrequently yet it measurably reduces printing costs. Employees buy into the policy because the automatic messaging helps them learn about the true costs of printing and the impact their printing habits have on the organization. We have found that when employees understand how printing impacts their organization, they are eager to do what they can to help their company achieve their cost savings and sustainability goals.